directly from a touch-tone telephone. and can be granted or denied access directly from a touch-tone telephone. The 1802 and 1802-EPD are available in two distinct styles: Surface mount and flush mount. 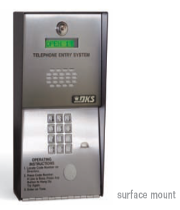 1802-EPD has a built-in electronic directory using a 16-character LCD display. Simple to use A and Z scroll buttons - Big CALL button to simplify use (EPD model only). 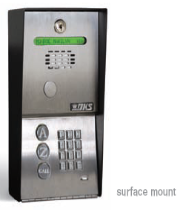 Directory codes can be set from 1 to 4 digits in length and can be randomly assigned. 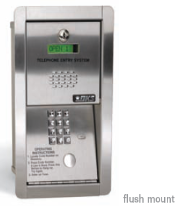 15 programmable area codes allow the system to be used in areas requiring 10 and 11-digit dialing. Two internal relays allow the system to control a main entry point plus an additional entry point. 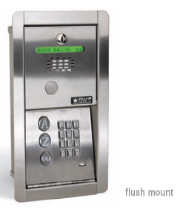 Built in time clock provides hold open time zones, entry code time zones and “Flash” entry codes. 5-digit entry codes available for special needs. 1802 stores up to 1000 telephone numbers. activation or to dial out a preprogrammed phone number. fall below 10F / -12C). 1802-150 frame assembly for installation. stainless steel faceplate can only be opened from the rear. Requires 1802-152 rough-in assembly for installation.